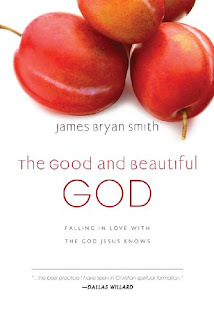 Here are some notes I’ve gathered from the first chapter of The Good and Beautiful God by James B. Smith. If this first chapter is any indication of what the rest of the book will be like, this is going to be a fun read! Chapter 1 – What Are You Seeking? How do we change? How do we become the type of person Jesus talks about in His Sermon on the Mount? Is that even possible? Smith believes it is and declares that we change through training our soul. Smith was mentored by Dallas Willard and Richard Foster and a lot of their influence is seen (read?) here in this first chapter. Is change in our lives brought about by willpower? Is that what it takes to change? Smith points out that our will actually has no power, but is controlled via our mind, engaging in the spiritual disciplines, and participating in the church, and the Holy Spirit. I like what he is saying here. Of course change in our lives involves God, but it also involves us working with God. Smith is not promoting salvation by works in any way, he is focusing in on how we Christians can live as Christians and be transformed by God’s grace in this wonderful process of being made holy. In this first chapter he asks us to rethink our lives and the stories that form our lives, to examine what we practice in regards to spiritual disciplines, and observe who we hang around with and what we are learning from them. Each chapter has a soul training exercise that is designed to engage you in the transformation process promoted in this book. The first exercise: sleep. We are encouraged to get a full day of rest. Smith pushes us to try and sleep until we feel we are fully rested and we couldn't possibly rest anymore. That’s it. It starts out that simple. This first chapter ends with a couple of reflection questions about what you experienced while trying to rest your body. You need to check this book out. This book is designed to be used within a small group and I believe God will use this book and the activities in it to bring about transformation to those willing to give it a try. Wonder where he is heading with the sleep concept? Possibly that getting enough sleep affects us mentally and prepares us for more constructive thinking regarding our souls? Funny how we try to fit so much into our lives to make them 'better' (ie getting less sleep) and we can reach a point of diminishing returns. The book sounds like a good one! Yes, it is very good! He is saying what you are thinking. We do not get enough sleep and therefore can't function in the way we were intended.